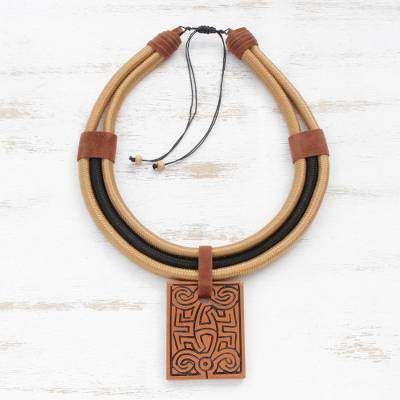 Adjustable Ceramic Pendant Necklace Crafted in Brazil, "Elegant Maze"
Taking your mind on a journey, this mesmerizing necklace from Brazil is designed by Cida Matos. She handcrafts a rectangular pendant from ceramic, featuring intricate maze-like patterns. Three cord strands center the necklace, decorated with suede accents. A sliding knot with cedar wood beads gives this accessory an adjustable length. You can find ceramic pendant necklace 'Elegant Maze' by Cida Matos in jewelry categories such as Geometric Necklaces, No Stone Necklaces, Suede Necklaces and Statement Necklaces. Enjoy exploring these sections for other Novica treasures.